What is Memory Stress Test ? Have you ever been interested to put out your PC system Ram under "Memory Stress Test?. This article coverage will provide you with some valuable information on how Rams are subjected to "Memory Stress Test" at the early stages of manufacturing.Most conventional test methods subject the DIMM memory modules to overclocking the memory bus and vary the power supply voltages to induced "Memory Stressing" during testing. Due to limited time constraint during production and the daily fluctuation of memory prices , manufacturers are forced to by-pass important test procedures and shipped fully assembled memory modules with very limited QA & QC testing. Under "Memory Stress Test", Production and QA engineers usually monitor the status of the memory stress test in real time and often manipulate the PC system timing setup to determine the quality level of the memories. The best method of fully testing a memory module throughly is to add some form of additional thermal heat to the module during testing. Memory Module Tester maker CST Inc, has announced a new test system and test method of significantly reducing the number of DDR3 memory modules which will suffer from ELF (early life failures). “Early Life Failure” describes the malfunction of memory chips long before their expected end of life. CST inc, calls the new process - "ABT" or “Accelerated Burn-in Technology.” This process is designed for memory modules to be subjected to near "Boiling-point" or the under influence of Heat-Stress in a controlled Heater Box, including adding voltage bouncing on the memory bus voltages and overclocking the memory bus by 10% over its recommended speed. The conventional method of memory module production testing is carried out by testing the memory modules on standard motherboards and memory testers with very limited diagnostic test time under room temperature. This type of process will lead to many RMA returns within 90 days after shipment is made out from the factory. In theory, by adding "Heat Stress" and "Bouncing" the supply voltages during memory testing , this process will accelerate and force marginal/weak dram chips to fail very early at the factory before they are shipped to the end-customers. 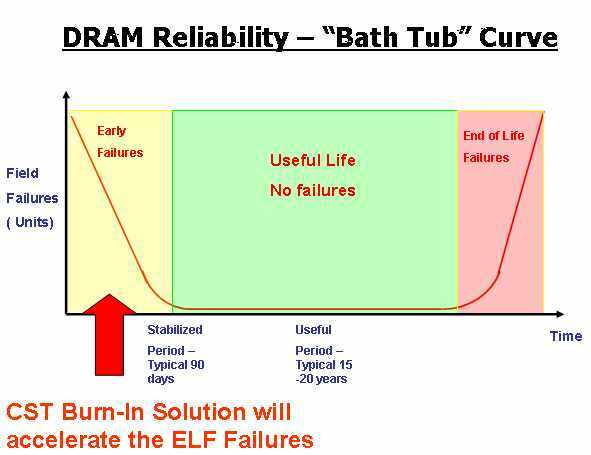 Premature component failure can be described using a “Bath-Tub curve” - see illustrations. CST 's “ABT " Burn-In test process is conducted in a custom-maded Burn-In box equipped with Halogen Lamps for rapid temperature ramp up and cool down during testing. The Custom made burn-in box sits right on the top of the Eureka2 , SP3000 and is capable of testing a single module or up to hundreds of DIMM modules per production shift. The DIMM modules are slotted onto Heavy Duty Yamaichi test sockets with CST’s own designed burn-in testing software and user interface. 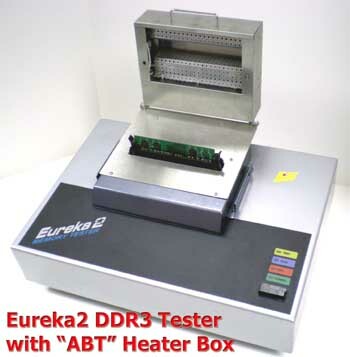 The "ABT" Burn-In Heater Box is able to elevate temperature up to 90 degrees Celsius in a matter of seconds with burn-in time for as short of 10 minutes or for of as long as 24 hours for aging modules.The main drawback of this type of test setup is that you must have a hardware memory tester. Another popular method of testing memory in large quantity is by using a regular PC Motherboard system and setup with some sort of Memory Diagnostic Software to test the memory modules. CST also offers a Memory Application Tester" is built with an actual Intel Motherboard system equipped with custom heavy duty test sockets, integrated video,keyboard, USB port and univeral power supply. With a simple push button to start testing, the Application tester quickly boots-up and displays the memory size , CPU Clock and Memory frequency and quicky test the Memory module. 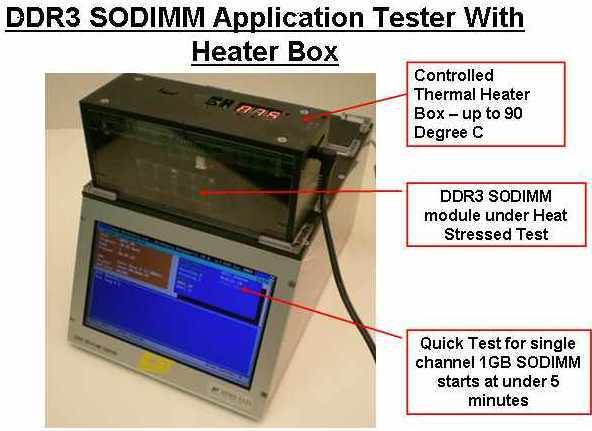 The " Memory Application Tester" provides added powerful troubleshooting tools capable to pin-point bad error bits location very accurately and offers an optional Heater Box to elevate the temperature during testing. CST Inc, understands the effectiveness of temperature stressing Dram Memory components with high temperatures and variable voltages, which can result to memory modules that never fails before the End of Life.